Each member or employee shall nominate a person in the declaration Epf Form-2 Withdrawal or EPF Withdrawal form, conferring the right to the nominated person to receive the benefit/amount in case of the death of the member or employee. It is a known fact that Epf Withdrawal Form from Employee Provident fund is not an easy task as many times as an employee wants funds except those permitted under The Employees’ Provident Funds Scheme Act, 1952. The following are the detailed information on withdrawl forms. Read the following points Carefully…..
EPF Form-13 : This Epf Form13 is used to shift the provident fund account from the one employer to the other employer, when an employee switches companies/employers. EPF Form-14 : This form is used to contribute to Life Insurance Policy from your provident fund account. EPF Form-19 : This form is useful to withdraw fund at the time of retirement or quitting the job. EPF Form-10C : This form entails the member who is less than 58 years of age for receiving a scheme certificate for retention of membership. Or for availing the settlement benefit through Employee Pension scheme or Old family pension Fund, this form can be used along with Form-19/20. EPF Form-10D : This form is useful to get the pension either by the member or the nominee after the death of the member. EPF Form-20 : This form entails the nominee or family member to get the provident fund after the death of the member. EPF Form-31 : This form helps the member to withdraw funds in the form of advance / loan / for medical reasons, for purchasing house, etc. EPF Form-5 (IF) : This form is used for withdrawal of provident fund/dues of the deceased member who died while in service. There are 4 stages of employment and life according to which you need to select the option to get your PF. These stages are given below. In this case both EPF and EPS amount will be paid. For this, in the Composite Claim Form – Aadhaar or Non-Aadhaar, select both the options; ‘Final PF balance‘ and ‘pension withdrawal’. However, if you are planning to join some company again in future, then it is advisable not to withdraw EPS amount and get the ‘scheme certificate’ by submitting Form 10C along with the Composite Claim Form. 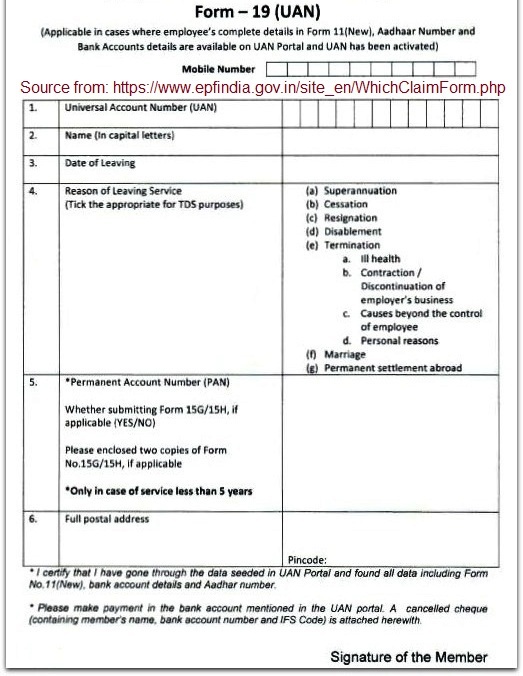 For those who have completed 10 years of service, they cannot withdraw the EPS amount; but can get the ‘scheme certificate’ by submitting Form 10C along with the Composite Claim Form – Aadhaar or Non-Aadhaar. An employee who has completed more than 10 years of service, gets pension when he attains 58 years of age, but a reduced pension can be paid from age 50 onwards. For this, you have to submit Form 10D along with the Composite Claim Form – Aadhaar or Non-Aadhaar. An employee who is more than 58 years gets full pension. You need to submit Form 10D along with the Composite Claim Form – Aadhaar or Non-Aadhaar.